In yesteryear, the lunchbox was a metallic object that was durable yet unwieldy and worked decently for keeping food fresh. Today, the lunchbox has isn’t quite as popular thanks to the advent of insulating lunch bags. These products work well to keep food cold or warm, and some even can do so for more than 10 hours. in fact, the best lunch bag for work can be absolutely invaluable. These modern-day products are also very durable and tend to utilize some very tough materials in their construction. In fact, lunch bags can be handy for tradespeople and outdoor workers that don’t always have access to refrigeration. A good lunch bag can be advantageous, but unfortunately, there are a ton of them out there on the market. For this reason, it can be a bit confusing when you’re trying to find an A+ product among all of the competitors. To make things easier, utilize this guide so that finding a product for your work lunches is much more convenient. Based on extensive research, excessive portion sizes are a significant contributor to obesity and weight gain. For this reason, even moderating the size of your packed lunch can make a major difference in your health. This product, which is from ThinkFit, helps you stay health-conscious by utilizing a bento-style setup for your daily lunches. This can be very useful for those looking to moderate their weight, balance their sugar intake, or only eat healthier. What’s bento? Bento is a Japanese style of lunch box that packs in food into a square-shaped package. 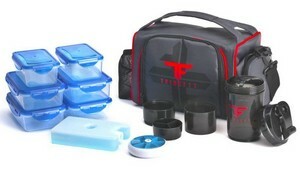 This product simulates this experience by providing six different Tupperware-like containers for your food. These are durable containers that fit inside and have technology in the lids that keep them sealed throughout the day. All bentos can easily rest within its confines, or you can just pack one or two at a time. Also included with this bag is a cold pack that also can double as a wall between the boxes. This cold pack can be frozen before work and will work throughout the day to keep the boxes nice and frosty. Sometimes, your doctor may recommend that you take certain medicines with your meals, and this product has you covered. Not only does it include a dedicated pillbox, but there’s a section specifically designed to keep it secure. One of the best features of this bag is how versatile it is. For example, you can pack as many bentos as you want and use the remaining space for other items. The ice pack is very movable, so you can use it to keep food cold in all interior sections simultaneously. While the spacious internal compartment is definitely a plus, this product also has some other noteworthy features. The one that might stand out for your needs is the side-mounted cup holder. ThinkFit has clearly considered that many would instead bring their own beverage, and as a result, they included this feature. To add more value, they’ve also included a modular three-segment cup that can manage hot or cold liquids with ease. This is very useful because you can pack in liquid medicines or up to three standard beverages at a time. On the opposite side of the bag is a pocket that will zip up, which you can use for belongings. This part of the pack is very robust, so even larger objects shouldn’t cause any damage to the material. When it comes to functionality, the bag can keep things warm or cold for about 10 hours. This should cover you if you don’t entirely eat everything. It achieves this by being double insulated and having a tough outer shell that keeps things nice and secure on the inside. The handle is double-stitched and robust. There’s also a nylon shoulder strap that’s very tough. This product keeps food cold or warm for 10 hours. The included bento boxes keep your food to the right portion sizes. The seals on the bottle aren’t the best. Sometimes, you might pack for a few people or you just want to pack in a few individual beverages. 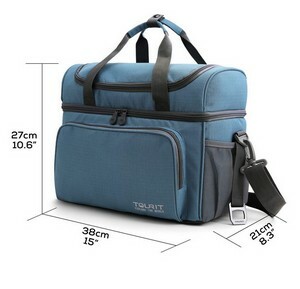 When this is the case, you’ll need a larger lunch bag such as this Tourit insulated cooler bag. This product has enough internal real estate for about 22 liters of beverages, which can translate to about 15 cans. This is very useful for those longer workdays. 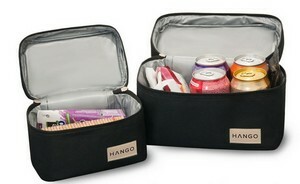 In addition to this, the product can even be used to tote large amounts of foods and beverages to a picnic. Internally, the product utilizes thick insulating foam to keep food at the right temperature for a longer period. In fact, this lasts the entire workday because it’s rated for 10 hours of food temperature regulation. The lid and all of the side compartments seal via leak-proof zippers, and the product uses double-stitching to prevent leaks. When it comes to compartments, this bag has many, which can add a lot of utility to the product. The largest external compartment is front-mounted, and it’s useful for items like smartphones or snacks. Additionally, there’s also a top-mounted compartment that’s great for keeping food items like sandwiches nice and frosty. This section also has a zippable smaller compartment, which can carry various smaller items as well. The final external storage areas that are available on this product have a positioning along the sides of the bag. These are useful for packing items like towels or napkins for your day and are great for storing utensils. These compartments are somewhat like flexible pockets and use a mesh material that’s flexible enough to accommodate small bottles. The main compartment, which is apparently the largest, has a 15 x 8.3 x 10.6-inch sizing. This internal space is cut somewhat by the lid since this is a compartment as well. The lining utilizes a polyester material that’s rip-resistant and easy to clean. For those that need an easy-to-carry design, this product also features a shoulder strap. Unfortunately, this product doesn’t have ice packs, but these are reasonably easy to find on the market. Additionally, for trips, the strap in the rear can allow you to attach it to a rolling suitcase. The outer shell is very resistant to rips and tears. This is a great drink bag for work. It’s available in three different colors. 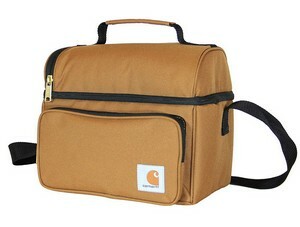 It has several compartments and pockets, which helps boosts the product’s versatility. It can be a bit too large for everyday usage. The lid doesn’t actually provide extra space. The mesh pockets aren’t as secure as the other compartments. As a brand, there are few manufacturers that are more well-known for producing job site-friendly products than Carhartt. This lunch bag, which even has a color option in the company’s iconic Carhartt brown, is definitely robust and work-ready. To start, they used durable polyester in the product, so there’s very little chance that it’ll get damaged at work. The zippers are also all-metal and are designed to be completely leak-proof, so if your ice melts, you’ll be okay. When looking at the main compartment, the first thing you may notice is the foil interior. This interior helps reflect both cold and warmth so that food stored in the bag stays at an optimal temperature. This is so effective that the bag can be used even on a 12-hour shift. Keeping food at a suitable temperature is vital when you’re working outside, so this is good for those refrigerator-less worksites. This compartment provides an internal spacing of 10 x 9 x 7 inches so that it can carry relatively large items. Like the previous product, the lid on this bag doubles as a compartment. Unlike that last bag, this compartment holds its contents in place via a mesh lining. This is reasonably advantageous because the netting allows for the cooling to reach this area of the bag more easily. This sub-compartment easily zips up so that you can separate your food. In addition to this, you can also access the contents of this area of the bag without actually opening the lid. You can do this by utilizing the zipper at the top, which works as a backdoor into the topmost area. As one might expect, with a reputation of robustness, Carhartt made this bag to last, so it has durable components. The handle, which is crafted from super tough high-denier nylon, also has a leather-like grip for comfort. This handle is triple-stitched onto the fabric of the lid and simply won’t tear or dislodge. In addition to this, the bag has a shoulder strap, which utilizes some of the same ultra-tough material. This shoulder strap makes the bag easy to carry with you as you tour the worksite. There’s only one additional compartment on this Carhartt product that’s along the front of the bag. This bag is perfect for storing items like smartphones, daily medications, or even some snacks for your workday. The product can accommodate and keep cool a six-pack of drink cans. It’s 100 percent crafted of sturdy, job-ready polyester. It’s secured using extra-tough YKK zippers. The bag could use a cup holder. It only has a single external compartment. The shoulder strap is very plain and isn’t padded. 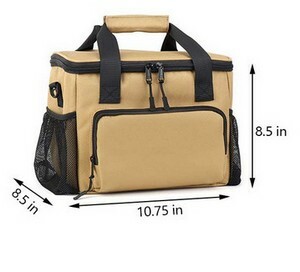 One of the most impressive features of this bag is its size; its internal dimension can accommodate 18 cans. 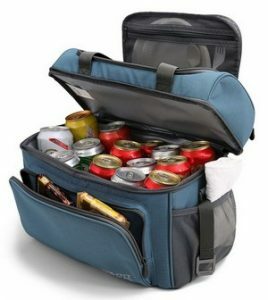 This means that this product can work to transport your drinks or you can fit a lot of food inside. With such a large capacity, you might think that it would be limited when it comes to cooling. Fortunately, the product has cooling and warming functionality that will keep your food at the desired temperature for 10 hours. Also, unlike some of the other products covered in this guide, there’s quite a bit of vertical space. This is because the lid on this bag doesn’t double as an extra food storage space. The top flap utilizes the same durable khaki material and is also double-zippered for convenience. This feature ensures that opening the bag is comfortable and convenient. In fact, with zippers that can be repositioned, opening the bag while it’s on your shoulder is relatively simple. In totality, this bag has five pockets including the primary internal one. This high amount of pockets opens up possibilities for carrying food and drinks with you as you work. In fact, in addition to the 18 cans that you can take in the central area, you can fit another two in the side pockets. These pockets are constructed of a tight flexible mesh material and have a width of about 8.5 inches. In front of the bag, you’ll find a slimline pocket that’s zippered and made of the same sturdy material. 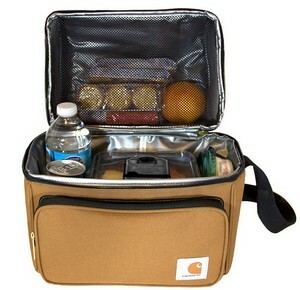 This compartment is suitable for carrying items like snacks and medicine and benefits from the cooling of the main compartment. Finally, in the rear of this F40C4TMP product is a thin pocket. This pocket is designed specifically for smartphones and will allow you to grab your device for a call quickly. This is also a lovely-looking product that will blend in well in the break room or at the beach. It has a tan coloration that’s not that different from the color of the Carhartt product, which is attractive. Insofar as the utility of the product, it has two handles: one at the top and a shoulder strap. The smaller of the two is easy to grip and is moored onto the product by four nylon straps. This attachment method makes it VERY stable and also allows the bag to be balanced as you’re carrying it. The second handle, which is the shoulder strap, is extra long, which makes it useful for taller individuals. This shoulder strap utilizes a padded surface at the top so that carrying the bag is as comfortable as possible. You can total of 20 canned drinks in this product. The handle at the top is very stable and secure and detaches when you need to open the bag. The shoulder strap is extra long. It has a total of five pockets. If you place heated foods from a microwave in the bag, it can damage the lining. It can be a bit overlarge for work lunches. There’s not much use for the rear bag save for carrying devices. If you’re looking for an attractive bag that will stand out, this Hango product might be what you’re looking for. Each of the bags (it’s a set of two) has a black coloration with tan-colored straps. 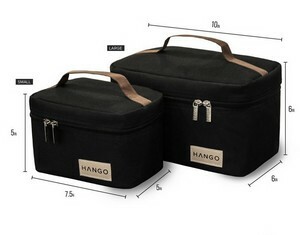 Also, each has the Hango logo at the base with metallic zippers keeping the food secure. Overall, the design is very minimalist and good-looking. Having said that, despite its stylishness, this product definitely has some useful features that provide utility as well. The first of these is the fact that this product comes in a two-piece set. The first bag is a smaller lunch bag that measures in at 5 x 5 x 7.5 inches. 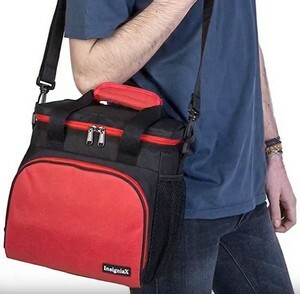 This bag is useful for when you want to bring small items with you to work like sandwiches. 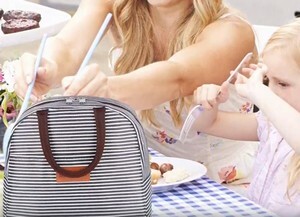 The second bag, which measures in at 6 x 6 x 10 inches, is designed to accommodate a six-pack or Tupperware-style packed lunches comfortably. Having two options like this allows you to plan which bag to bring under different situations. In fact, the larger of the two provides more than enough space for two distinct lunches. When it comes to the material of these products, each has a construction using 300-denier polyester, which is quite durable. This means that the bags will resist rips, slashes, and are virtually leak-proof. All the bags in this guide are designed to keep food at the right temperature, and this product performs well. When properly sealed, the bag should keep food either warmed or cooled for at least five hours. The zippers on these bags are also relatively high-quality; they are made of attractive stainless steel and are large. Each bag has two for the main compartment, which allows you to customize the positioning of the zippers for accessibility. When you purchase the product, it comes in a gift bag that matches the stylish design of the lunch bags. As a result, this can make for an excellent gift for someone that wants a lunch bag that’s easy to accessorize. It’s worth noting that the bag comes in two colorations: the black and tan featured here and an all-pink variation. Hango utilized super-tough polyester with a denier of 300 in the construction of this bag. When it comes to design, this is a beautiful bag. It comes in a set of two so that you’ll have options for portion size. The handles are made of tough suede and feel very comfortable to hold. It doesn’t have as much insulation as some of the other products featured here. This product only has a single compartment. There isn’t a shoulder strap, so you’ll have to carry it by the handle. When you’re in the market for one of these types of products, you’ll want to be 100 percent sure it has the right features. In this part of the guide, we’re going to be hitting on some of the most essential elements of a good lunch bag. When you’re looking to purchase one of these products, the intent should be to buy one for the long haul. For this reason, you’ll want a product that is tough enough to survive the rigors of the worksite. Remember, these are designed to be used outside of a fridge, so this can expose them to rough environments. A good rule of thumb to consider when purchasing one is how thick the outer shell is. When they construct a product like this, the go-to material is typically polyester or nylon. When measuring the thickness of these types of materials, the manufacturers typically measure denier, and the higher the denier, the more durable the product will be. In addition to the material construction, you’ll also want to consider the quality of the zippers. The best products have zippers to provide a reliable seal, and if you want dependability, YKK zippers work the best. These zippers are usually made robustly and will have a design that will seldom jump the track and cause issues. As mentioned, these products work well in areas outside of standard refrigerators, so they’ll need insulation. For example, say you’re going to be leaving your bag hung on a hook or in a break area, you’ll want your food to stay cold. Conversely, when you want your food as warm as possible, a bag provides an insulating layer for your bag’s contents. Bag insulation comes in different degrees, and some are just thicker than others. As a general rule, you’ll want to purchase products that have at least a five-hour thermal management timeframe. This will ensure that your food either stays as cold or hot as you want it during the workday. Many of the best products that are available have a 10 hour-plus degree of temperature maintenance, but performance varies. Lunch sizes vary, so finding a product with an overabundance of physical space will typically ensure that you’re always prepared. As you’ve probably noticed, many of the products in our review section have larger capacities, which make them more versatile. In most cases, a product that can accommodate a six-pack will be able to carry most lunch options. Additionally, some products come with included Tupperware-style containers, which can help you with portion size. If you have a long commute, you’ll want a bag that won’t cause fatigue as you take it to work. Comfortable handles make these products much more accessible to carry when you’re commuting. Usually, most products on the market have handles, but ideally, you’ll want a bag that has a shoulder strap. If your bag only has a standard grip, some cushioning at the top point can make carrying around easier. With shoulder strap bags, it should also have some cushioning to prevent the bag from digging into your shoulder. It’s also crucial to consider the stability of the strap/handle, so they should be strong and balance the weight evenly. Nylon straps tend to make for solid and stable straps/handles, so try to purchase products with these materials. The main compartment should have ample space for you to take larger portions, but additional compartments are useful as well. Many of the best lunch bags will have space for knick-knacks as well as extra room for beverages. These extra features add a bit of versatility and utility, and in most cases, manufacturers even create pockets for smartphones/devices. • Mesh Pockets: Mesh pockets are very versatile because the mesh material is usually flexible. This means that you can use these to carry loose items like napkins or more substantial things like soda cans. In most cases, these pockets are designed to be very tough and shouldn’t rip or slash easily. • Lid Compartments: Bags with lid compartments tend to have a larger size to accommodate the extra carrying space in this area. Lid compartments can work as extensions of the central region of the bag and use a mesh lining that functions as a separator. When this is the case, the insulating features can keep food items in this area cold or warm as well. • Folio Pockets: Folio pockets are thin pockets that are usually positioned on the back end of lunch bags. These are designed to hold small documents like passports or even a compact smartphone. • Ice Packs: This can save you money since you’ll need an ice pack to keep your food cold for a more extended period. • Separators: Separators are usually made of a thin material that will help you keep foods stored in the bag separate. • Bento boxes: Bento boxes have been a Japanese convention for years, and they allow you to pack food in preselected portion sizes. These are useful for packing rice dishes or even sandwiches. • Containers for Drinks: Many products come with cup holders or mesh pockets that can accommodate drinks, and some even include drink cups. Finding the best lunch bag for work can make your workday much more pleasurable. All of the products that we’ve selected for the guide are excellent, but the first two stand out the most. 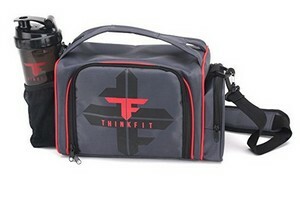 The first, which is the ThinkFit Insulated Lunch Box, has a very versatile design. Add to this the fact that it comes with its own cold pack, and it’s just a great value. 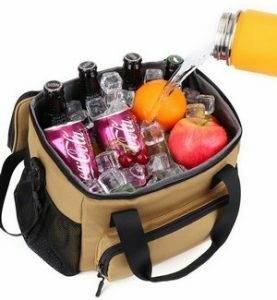 The second product, the TOURIT Insulated Cooler Bag, also stands out because its compartments are very well thought out. You can also fit a lot in here, and it’s also an excellent product for beachgoers.